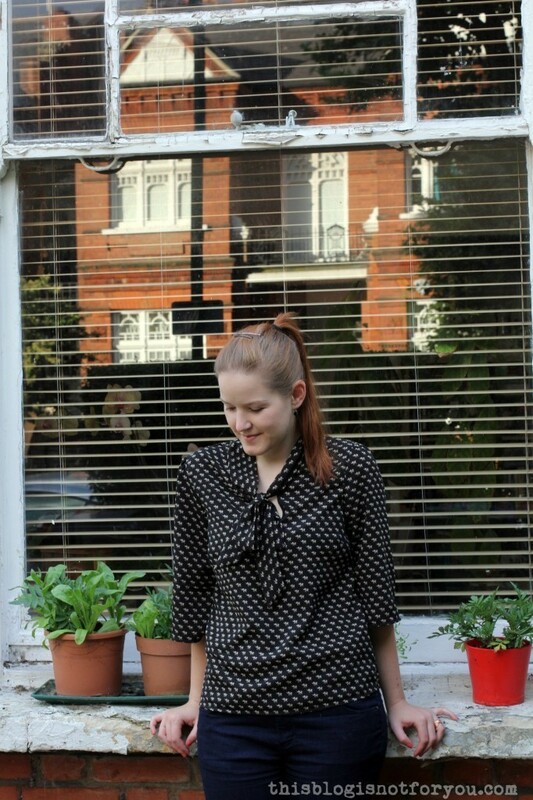 May I present to you – the Lottie blouse! Probably my new favourite pattern. It hasn’t been featured too much in the online sewing community, though, perhaps because the only chance to get hold of it is by buying the latest issue of Love Sewing Magazine. I didn’t like the magazine too much (it’s only their second issue) and mainly bought it because of the Lottie pattern set (skirt and blouse) and the cute tape measure that came with it. I’m pretty sure you can still get it in stores (I’ve seen it at WHS, Sainsbury’s etc) and the pattern makes it totally worth buying. 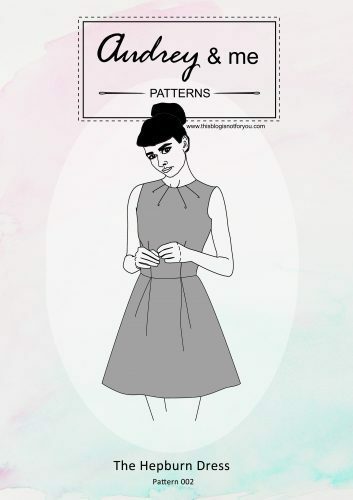 The pattern is very basic, quick to trace and sew. I haven’t tried the skirt pattern yet (a very simple pencil skirt), but I already made three blouses! There were a few issues with the pattern, though (mainly the instructions), which I personally didn’t mind too much but they could be quite confusing for the “adventurous beginner” this pattern is made for. Some of the diagrams had a few mistakes and were in the wrong order, which can mess up the whole sewing process if you are not aware of it (or at least make the whole thing harder than it really is). 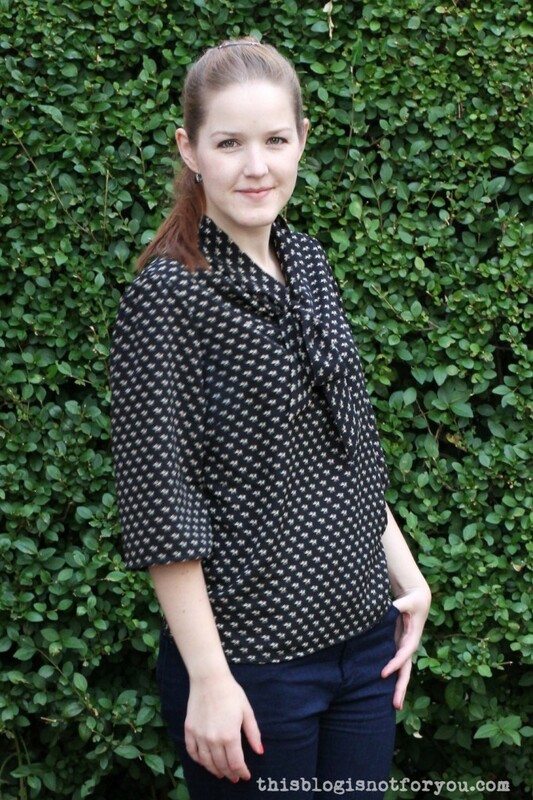 I really love the fit of the blouse and the pattern probably works best with drapey fabrics. For this blouse I used a viscose/polyester fabric with an elephant print, that didn’t drape as well as I thought it would, but I still like how the blouse turned out. I also made a bright red version with a very lightweight rayon fabric (my favourite of the three I’ve made so far); I will share this one with you another time. I bought the fabric on Walthamstow Market the other day when I was shopping with Dani. 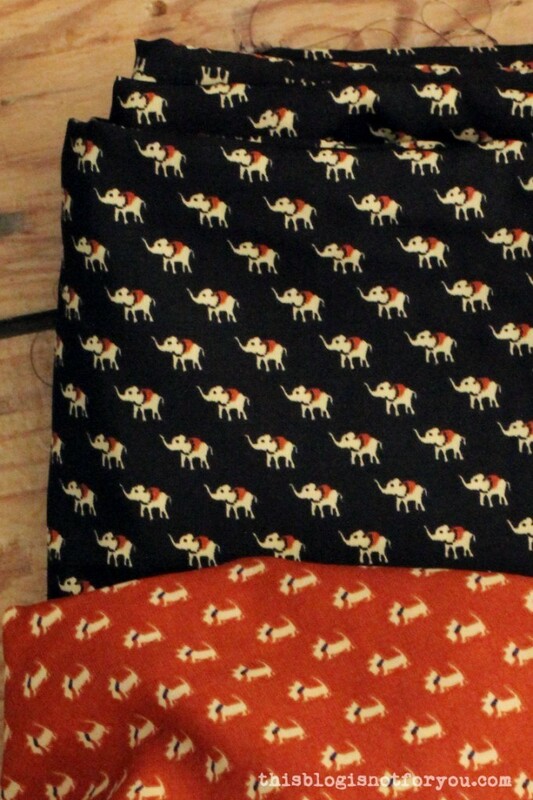 Next to the elephants I also got the same fabric in a different colour and a super adorable scottie print. I suppose the scotties will be used for a Mimi blouse, which is on top of my to-sew list at the moment. 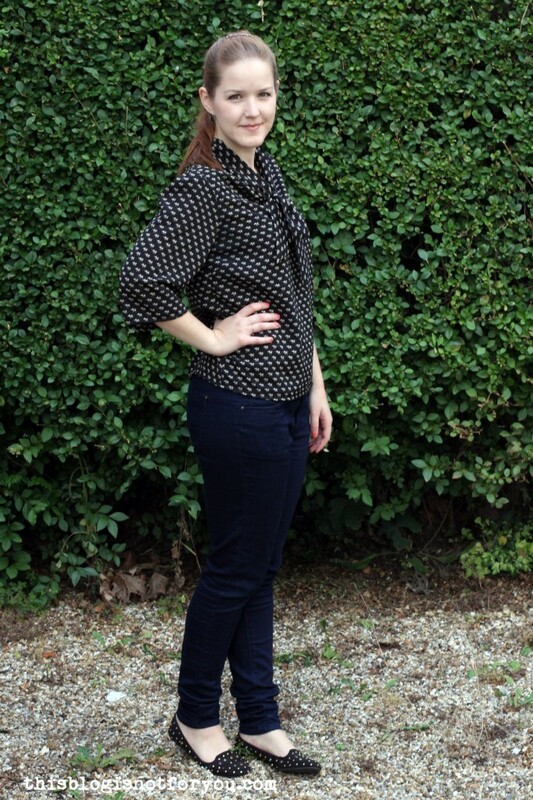 So this is the first of the many blouses you will see on le blog in the future. I always thought dresses were my thing, but when I’m at work I always end up wearing trousers. 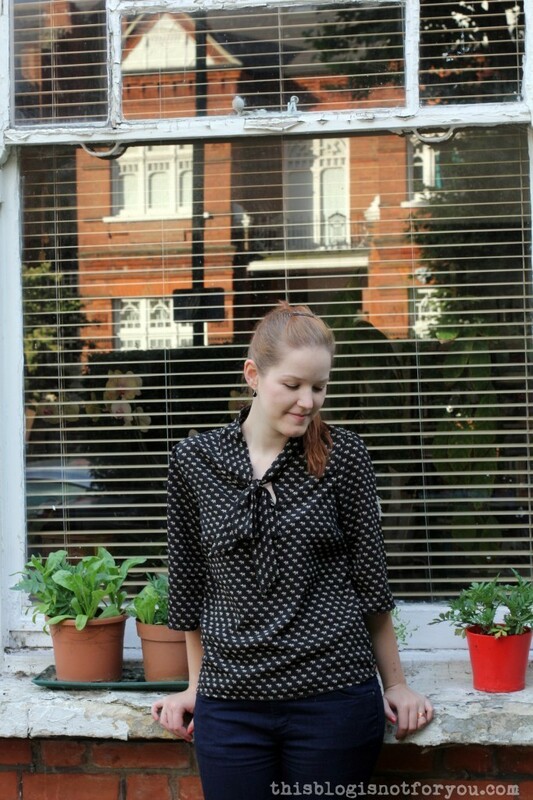 I sometimes feel like I sew what I would like to wear instead of sewing garments I acutally wear in every day life. That’s why I decided to sew more things I actually need and not only things I think are cute and pretty. 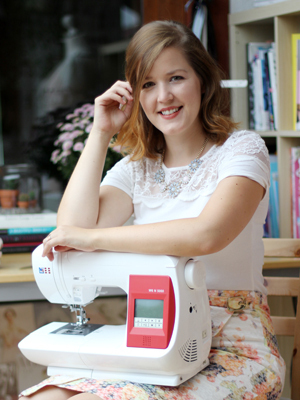 Do you wear what you sew? I’ve still yet to make any pattern I’ve gotten free with a magazine! But I have this on my list 🙂 I’ve found the general problem with sewing magazines is that they are full of projects, which I hardly ever get around to making, and there is not enough features, things to read etc. As there are lots of free diys on line, they need to reconsider their content. So cute! 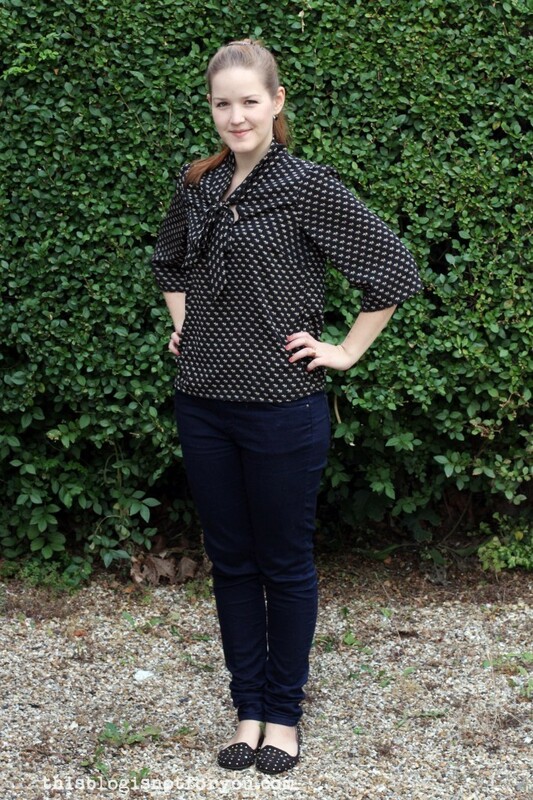 I like the style of the blouse – and the fabric too! This is so cute, really love the fabric. It’s a shame that the magazine isn’t very good though, I haven’t seen it in any of the newsagents near work or the huge supermarket I go to. I tend to wear dresses at work and make dresses so I’d say yes, I pretty much wear what I make! Really love the red scottie dog fabric too! It’s probably sold out at WHS, but I’ve seen quite a few in different Sainsbury’s. You’re lucky! I wish I could wear more dresses at work (no one is preventing me from doing it!) but often it’s just more practical wearing jeans & tshirts/blouses. Cute blouse. I love this pattern, you can also get the magazine in Asda. Minerva Fabrics may also sell the pattern since they sell the company’s sewing patterns, so one could check out their website. Hi Allison! I didn’t buy the fabrics from the man outside Sainsbury’s. The market is open every day Mon-Sat (I’m not sure about Sun). There are quite a few fabric shops in Walthamstow, all right next to the market. If I remember correctly, I bought both fabrics in the shop that’s at the very end of the market, on the left side of the High Street (coming from Walthamstow Central Station). It’s called Sai Fabric.The elephant fabric was just £2/m and the scotty £1/m! An absolute steal! Haha, Dani! It IS the blouse I wore on Sunday! I guess I confused you by constantly talking about the red one and then wearing a red cardigan all evening 😀 But yes, I made the blouse with three different fabrics and it looks different every time! Good see someone sewing the blouse from ‘Love Sewing’. I am in the process of doing the skirt this week. I have already had to add sizing to the pattern for my hips, so doing a muslin first. I had been avoiding the blouse, because it looked a little flouncy for me, but actually seeing it made up in colours /material that I would wear has made me rethink (maybe I just leave off the bow). Can’t wait to see the red rayon version! Great! I’d love to see the skirt when it is finished! 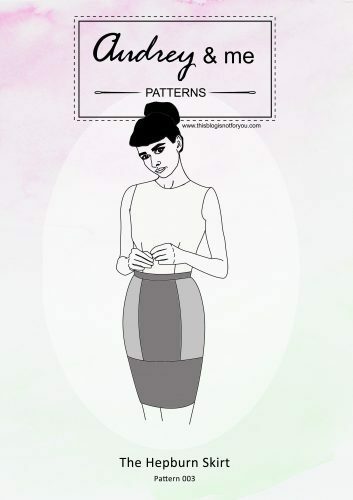 I’m thinking about making it, I’m not a big fan of the skirt pattern, but it can’t hurt having a basic pencil skirt in your wardrobe! Love this style of top although I’m not willing to try a blouse yet:) glad for honest reviewers like you who let us know what to look out for. I find I’ll try a pattern knowing there are some trouble spots…if I read a review like this and know about it. I hadn’t seen this pattern until now and it is perfect for the office. I can see why you have made a few versions. I like the neckline as it doesn’t look like there is too much fabric around your neck which can happen with front bows. Oh, and elephants! Everything looks good with elephants! I’ve literally just bought the fabric to make this up for the first time! It looks fab (all three versions!) so will definitely tackle it but would appreciate knowing which bits are the wrong way round as I’m definitely a beginner! First of all, the neck tie is not shown in the layplan and also did not fit on my fabric (I tried on grain and cross-grain), so I had to add a seam at centre back. Secondly, I found the order of the steps in the instructions a bit confusing. It’s not too bad acutally, just make sure you read all of the instructions carefully before you start to figure out the bits that might be confusing otherwise. Good luck!